Maybe its just another sign that I'm getting older but I am really disappointed by the newest generation of five squirrels that live and eat in our yard. From memory, it looks like we get three to four sets of new tree rodents each calendar year . Either that or the existing ones get such an extreme makeover every few months that we're not able to recognize them as the same old yard pets. 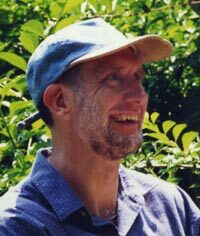 We've been feeding the squirrels for about twenty-two years - so simple math says that we've seen the coming of over one hundred generations. But equally important to these ancestral generations (child<-parent<-grandparent<-etc.) are what I would call Evolutionary Generations - a common set of traits and behaviors that may span several age groups. It seems to me that in terms of general basic behavior we have had three distinct E.G. 's - what I would call Generation R2D2, Generation Ex and the iPod Generation. When we first started to feed the squirrels they were ravenous, rapacious, damaging and destructive - the dreaded two r's and 2 d's, Generation R2D2. 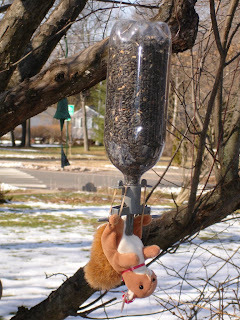 Our first feeder was a plastic "Droll Yankee" multi-perch cylindrical diner. It lasted about a week. The squirrels attacked it in place, chewing through the polymer sides until the sunflowers cascaded to the ground like a cataract of black oily food pellets. On days when they were particularly cranky they knocked the feeder to the ground and pushed it across the yard like an out-of-control bobsled as they burrowed deeper and deeper into their bounty of daily sustenance. We replaced this Droll Yankee with another one that was hung from a longer wire in a different spot. Then another. In between I tried covering the rodent holes with duct tape. Same results. 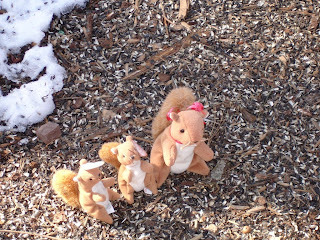 Clearly the squirrels were learning how to play this game much more quickly than we were. Then our son bought us a different type of feeder - one that we still use today. The new device wasn't technically a "feeder". It was instead a perch that screwed on to the neck of a one liter soda bottle. Holes are then punched into the base of the bottle; and it is wired, loaded with seed, and hung perch-end down. 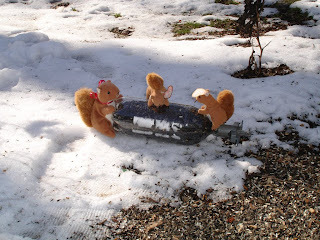 The results were the same as with the Droll Yankee but, with the help of several cola consuming friends and relatives, the maintenance costs for the storage component of our squirrel feeding system dropped considerably. 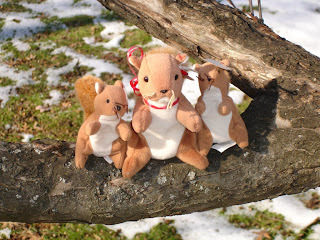 After a few years the damaging and destructive aspect of the squirrels personality began to mellow, although the ravenousness and rapacity remained. And the squirrels became much more entertaining - performing gravity-defying munching maneuvers such upside as down toe-dangles and bottom-up abdominal curls. Seeds were still sucked out of the feeders at the rate of about fifty pounds a month. But the bottles themselves stayed in place for several days, then a week, and finally several weeks before becoming so riddled with holes as to be unusable. Those that "fell" to the ground however were still demolished without mercy. As were hanging ones that were allowed by this author to remain empty for unacceptably long periods of time (more than one day). Many times I dragged myself outside to the seed bucket, shivering and shaking with fever, for the sole purpose of coaxing one more day of life out of an old 7-UP bottle. Ultimately even the empties remained unscathed for a few days at a time. And finally we came home from a two week vacation to find a totally vacant one still hanging and functional. It's not necessarily easy to spot the exact point when one behavioral generation replaces its predecessor but I would define that event as the official birth of Gen Ex. From the perspective of our family room window, Gen Ex is by far the most energetic and entertaining of the three groups - thus the name, Generation Ex(ertion). These little gray guys and girls certainly exerted their bodies to their utmost as they positioned themselves for their gluttonous gobbling. And also their minds to come up with more and more challenging ways to get to their oily carbohydrate prize. Our bird feeding bottle dangles from about one and one half feet of thin picture hanging wire. The first Gen Exers would climb slowly headfirst down the wire, and hang by their little back feet while their bodies were draped along the side of the bottle with their mouths next to the feeding perch. Then they began running down the wire. Next they slid down like firemen on a pole. And finally some bypassed the wire completely and tried direct leaps-of-faith onto the base of the bottle. They failed of course. But still they kept trying. Others preferred to lower their entire body down to the perch itself, which they then held onto birdlike, with their hind feet. A few of these bottom feeders contorted their bodies back on themselves so as to bring their mouths in touch with the seed dispenser. The more creative ones however hung upside down from the perch, as motionless as a pelt in a fur stole. Then, when the hunger spirit moved them, with the sheer force of their abdominal muscles alone, they raised their upper body to form a u-shaped, chest-to-thighs seed sucking machine. Once there they would stuff their pouches then lower themselves down to the fully inverted position and eat - to then return again and again. Then suddenly all of the action stopped. First I noticed that I couldn't remember the last time that I had to replace a battered bottle. 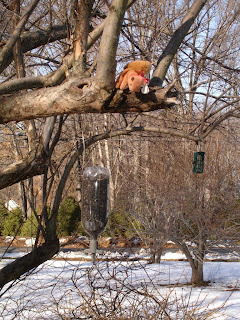 Then I noticed, of all things, a plethora of birds eating at, of all things, the bird feeder. I scanned my oak trees looking for squirrel nests. Sure enough there were several of them. 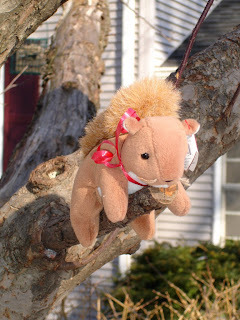 I tuned my ear to listen for the screeching, scolding noise of the squirrels, and I heard it clearly and frequently. I just didn't see them at the feeder. And then I looked down - at the ground under the bottle diner - and there they were - lolling lazily amidst the carpet of rejected and carelessly dropped sunflower seeds - leisurely stuffing their little faces. No need to work for your food when you can get it sent down to you for free. It made me think of the current generation of music-loving, internet-using people walking along in their own private little worlds, listening to their favorite songs on their tiny iPods or other "personal music players". Instead of purchasing their CDs from stores, they down load the tunes from the Internet (frequently at no cost) onto their hand-held devices, or send their own copies to each other (again gratis). It's a view of life wherein the consumer feels totally entitled to no-fee usage of the world's songbook, and, at the same time, that collection of music is made instantly available to the listener who, with virtually no effort of their own, gathers it in. It's the iPod Generation. Maybe the current set of tree rats don't look any fatter then their ancestors, or move any slower (when they do move that is) - but as an ardent exerciser I'm still concerned about their apparent lack of physical exertion. It would be just awful if the creatures of the wild had to resort to running their little squirrel buns off on an at-home treadmill (like their domesticated hamster cousins) rather than being able to stay fit just doing the normal activities of their daily lives. But mostly I'm concerned about their passive acceptance of whatever food comes their way. The Generation R2D2 gang certainly didn't. They acted as if they were living in a State of Nature like the one in which the philosopher Thomas Hobbes described life as "nasty, evil, brutish and short." The R2D2'ers took things into their own paws, probably way more than was necessary, and (at least in their own little minds) bullied the world into giving them what they wanted. But in truth they survived largely because those of us whom they felt they needed to badger were already predisposed to care for them. Their successors, the Gen Exers, seemed to view their world as a meritocracy - a place where what you got was based on your achievements. They assumed a cosmos fat with food. And it was. 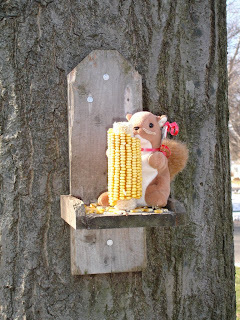 And a compensation system that awarded the more industrious and entertaining squirrels with the most and best food. And it did. Because of their outstanding performances this generation saw the addition of the a table-like corn cob feeder to our dining facilities especially for them. But I just can't figure out this current bunch. It would be too much of a cliche to say that they think the world owes them a living - and I don't really think that it is true either. But they do seem to act as if the world is a totally supportive place, ready and willing to let them be and do whatever they want to. It's similar to what I have heard said about some of today's "post-feminist" women who seem to feel that world, by its very nature, is a nurturing and accommodating place - without any necessary effort on their part to keep it that way. Or perhaps the steady drone of dependably down streamed delicacies has deadened their minds to the possibility of famine. Fortunately the squirrels are been replaced at the feeders by, of all things, birds. More and more of them. Different and more different kinds. Purple Finches, Nuthatches, Cardinals and Woodpeckers. Chickadees, Titmouses and (would you believe it?) Grackles. They actually are pretty fun to watch. Certainly more interesting than the iPod squirrels. These descendants of previously entertaining little rodents need to be made aware of the law of supply and demand - that those of us on the supply side demand something in return for our generosity. Generation iPod - be afraid! Be very afraid!